For what seems like the thousandth time over the past few years, the market has read the tea leaves from Fed communication (in this case, the minutes of the July meeting) and apparently come to the conclusion that any sort of tightening is rather less likely it seemed beforehand. Some of this is no doubt a Pavlovian response or, to put it somewhat more charitably, the triumph of empiricism over theory. The trigger, of course, was the twin mentions of the risks posed by China and the rising US dollar. When one considers the events of the other week- when China weakened the RMB against the dollar as a policy decision (cloaked however it may be in the guise of "market enhancement"), it seems eminently reasonable to suggest that anyone worried by these factors last month will be even more cautious now, thus rendering the chances of an imminent rate hike remote. Of course, there was a line about the risks to domestic economic and labor market activity being "nearly balanced", but hey- the Fed has spent the last six years maintaining an Eeyore-ish fascination with doom and gloom, so it's hard to fault the market too much for assuming that the future will look like the past. All of this, however, ignores a sublime irony. China finds itself struggling to extricate itself from a misallocation of resources at least partially caused by its decision to essentially delegate its monetary policy to the Fed via the FX peg. Sure, PBOC had its own policy rates, instruments, RRR, etc...but for a long period of time domestic policy in China was much easier than it should have been, partially to mitigate the capital account implications of the peg. Now that the capital account is offsetting the current account, by and large, the significance of the issue has faded. However, the market has apparently decided that the Fed will now delegate its monetary policy to the PBOC; in other words, the dollar's strengthening against the RMB thanks to the peg adjustment will now take the place of the putative first rate hike in September. There is of course no guarantee that the Fed will do this, but the minutes certainty suggest that this type of mentality is held by at least a few committee members. Needless to say, Macro Man doesn't think that delegating US policy to PBOC will work any better than China's delegating its policy to the Fed was. He was intrigued, therefore, to see that equities- that most Panglossian of asset classes- shrug off the "good news" and finish on a downer. A growing fear of a Chinese meltdown? The weakness of the median stock finally filtering through to the average? Algos playing "orca and baby seal" with the market on a hot August day? Macro Man isn't really sure, but in normal circumstances the divergence of price action to newsflow would be telling. None of this is to say that the Fed shouldn't think about China. Of course they should. 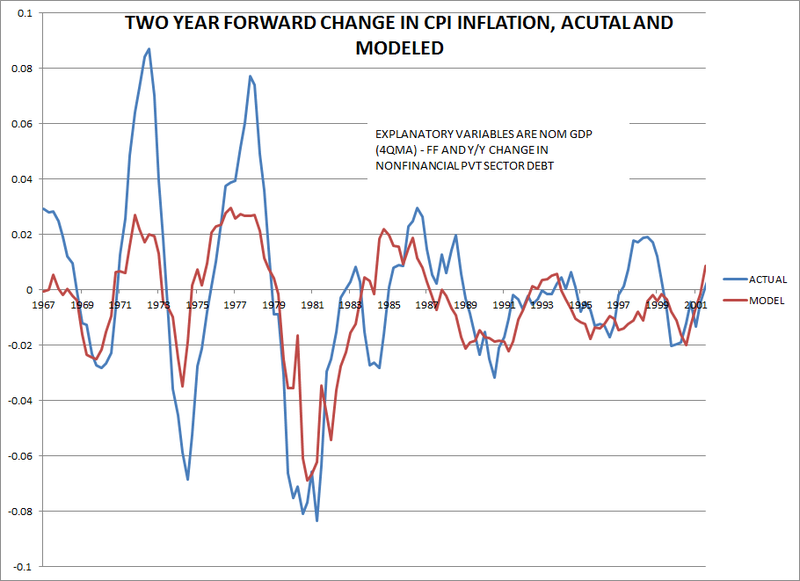 However, the focus should be on the secular impact on inflation, rather than the cyclical impact on growth. Macro Man has addressed this issue a number of times, both on wages and on prices. Put it all together and it looks like this. 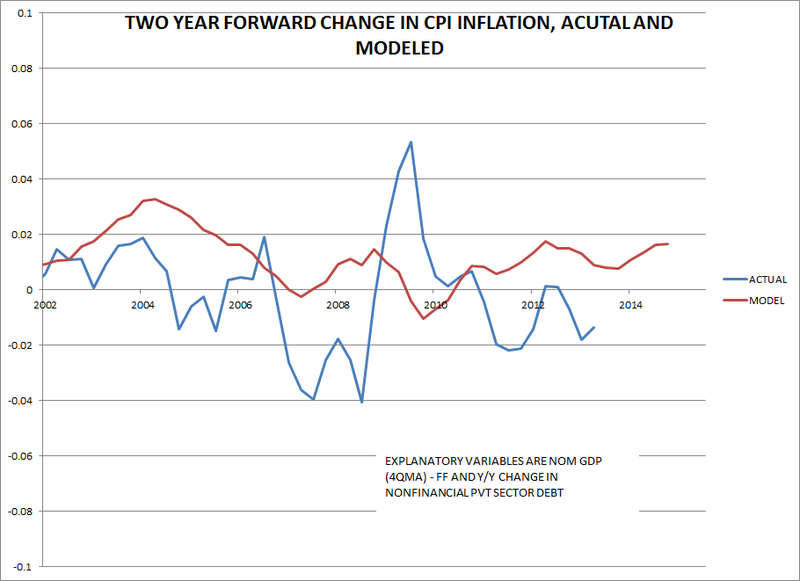 Interestingly, running the regression with core CPI actually reduces its accuracy by a small amount- so much for core inflation being a "superior measure!" 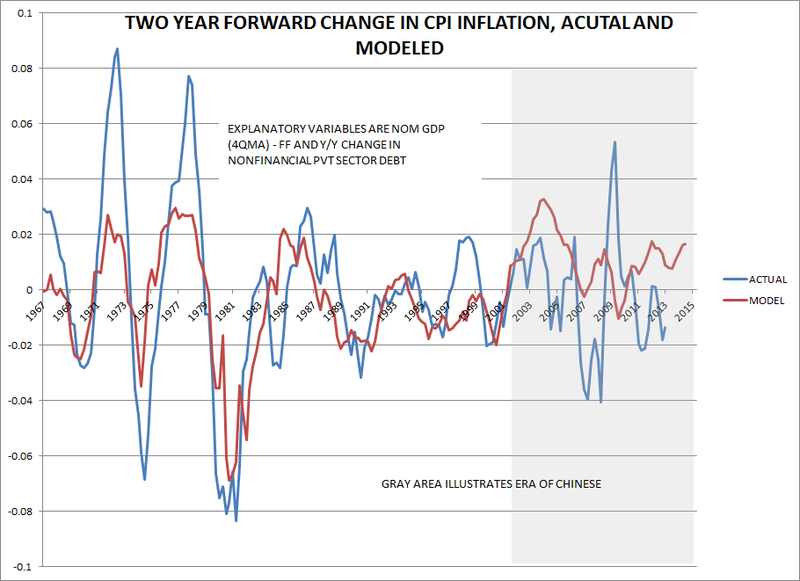 In any event this seems to be another brick in the empirical Great Wall of Evidence that China has had a meaningful downward impact on inflation in the US and other industrialized countries. 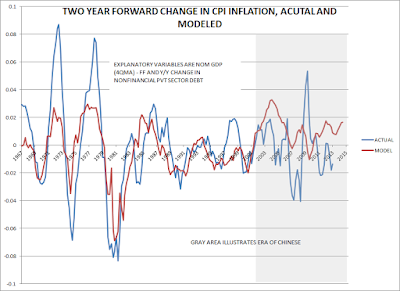 To ignore this impact would appear to be naive at best, yet we still see the Fed apparently operating under a domestic Philips curve model of inflation. At the end of the day, Macro Man doesn't actually think that the Fed will outsource policy to China (though it's going to be awfully difficult to distinguish between doing that and standing pat from here on out.) 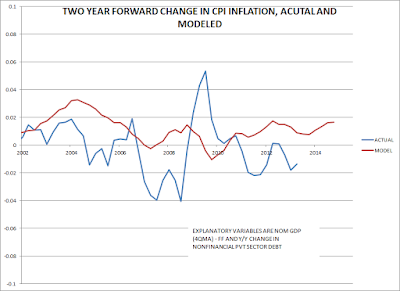 He would, however, like to see a more realistic assessment of the inflation target; given the global backdrop, hitting 2% on the core PCE deflator for any meaningful amount of time looks like dreaming the impossible dream. Somewhat fittingly, that song is from the musical Man of La Mancha; expecting that monetary policy can drive inflation towards its target is little better than tilting at windmills. I expected more USD weakness, market reads a U.S. Fed worried about China. Taiwan and Korea not looking flash , early warning signs. Dax almost at 15% correction from March highs. Back to Jan levels. That's 5 months to knock 15% off all time highs in s QE driven market. The QE model is broken, or rather, the tide has gone out. A Tsunami of central bank easing coming or just the wreckage & destruction that comes with them? No doubt an opex bounce between here and Fri.
Count down to FB saying he bought SPX 2 hrs ago .....10 .. 9 ..... 8 ... August 19, 2015 at 7:15 PM"
I think Pol meant Funny Money (FM)." *Sigh*. So when I post entry/exit levels of trades, a couple of posters object & ask me to stop on the basis of the trades being too short-term (therefore boring). When I stop posting details, posters, like Pol (above), accuse me of lying & posting hindsight trades. When I make a prediction that UK & US CBs will not rush to raise rates this year, and point out that this now appears to be coming true, I upset a couple of others. Look, I like to challenge consensus views, but I have no interest in posting child-like, disparaging comments, or resorting to expletives etc as some do. There are plenty of losing traders on the internet who do this in abundance. So on that basis I'm done here. Good luck & wishes to: washedup, LB, abee, hipper, & the rest of you. I sincerely wish you well. MM, clearly the fed is in no rush. It's not about whsy it should do but what it will do. If the S&P drops by more than 5% they will lay off. As for me regarding equities I am starting to become uncomfortable. I had a feeling we would be going lower a few weeks ago and its always nice to be somewhat in tune with market movements (my focus in primarily Europe). But now from where I sit it I wonder if this market really will be drifting lower? Problem is that this slow kind of silent bearish market makes me confused. I much rather have (normal) fast downshift where you can have a guestimate when its done for the moment. So, to get a feeling for it I just decided to go long in smaller size. Guess I just became a BTFD’er. And thanks MM for a great post. FM, where can I follow you in the future? TWTR? 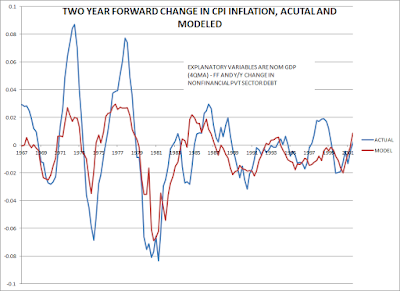 MM, including import prices as a variable may help improve the explanatory power in the post 2001 regime. At the same time, it would also probably validate your point. LB, with Australia passing 100 at least we can avoid a Royal Commission following the final test. England have been splendid. Congratulations. @ skippy sure, but using one price series to explain another borders on the tautological, innit. Yes - fair point MM. Caught at first slip. Wow, Dax now 16.4% off highs...heading for a bear market in QE. Look what you've all done. Upset FM and now the arse has fallen out of the market. Come back FM! Perhaps Mole's blog is more appropriate for your trading style. There you can post your trades in 24/7..
Good strategy..get money from EU then resign! I as well welcome FM back. It is always important to learn how others interpret markets. And i like bullish people. That said, im happy i cut the already moderate long position in half after US numbers today. To me uncomfortable still is the main feeling. Tom is gonna be ugly, i cant see any way around it. Who wants to buy Friday afternoon in August. Whoa FM where are you going - stay here and buy dips in the budding bull market in pessimism - that rally is just getting started. That said, the small country you've purchased with your BTFD winnings will surely need your attention. Good luck to you Sir. Come on, FM, don't go ... me thinks there are a fair bunch of us who don't comment regularly but nevertheless read your posts with humor AND interest. @Anon 12:12 PM: V sry, I currently have no TWTR/blog etc. @Nico: I refuse to have a battle of wits with an unarmed opponent. @Anon 7:12 PM: Thx for the link, I'll check it out. @MM: Thx for your comment. We haven't always seen eye-to-eye (which is fine - takes 2 to make a mkt etc) but your posts have always been of v good quality and your comments balanced. All the best. @washedup: V gracious of you - we ever meet, drinks on me. @Anon 11:15 PM: Just added you to my drinks list. @Anon 11:19 PM: Again, v kind. I've been fortunate to have had an excellent year P&L-wise, but feel there's much more I could do to develop further. In this regard I'm finding -ve comments etc unhelpful (even if I do deserve them), hence my reaction. At the v least a break will do me good. So I intend to continue my break from the blog, but it felt rude not to at least reply briefly to you all. Have a great w/e. August 26, 2015 at 2:35 PM × This comment has been removed by a blog administrator.